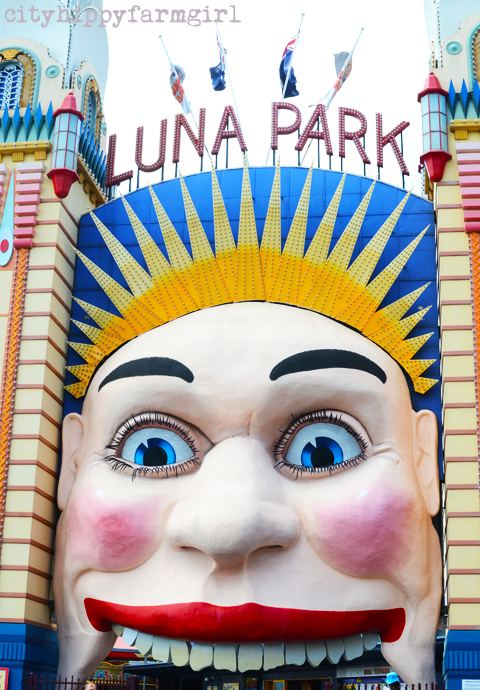 What do Doctor Who and Luna Park have in common? An eight year old boy that’s what. A very excited eight year old boy. For more, ‘for the love of a dalek’ kind of stuff, have a look at Mel’s fantastic crocheted dalek. Absolutely brilliant! 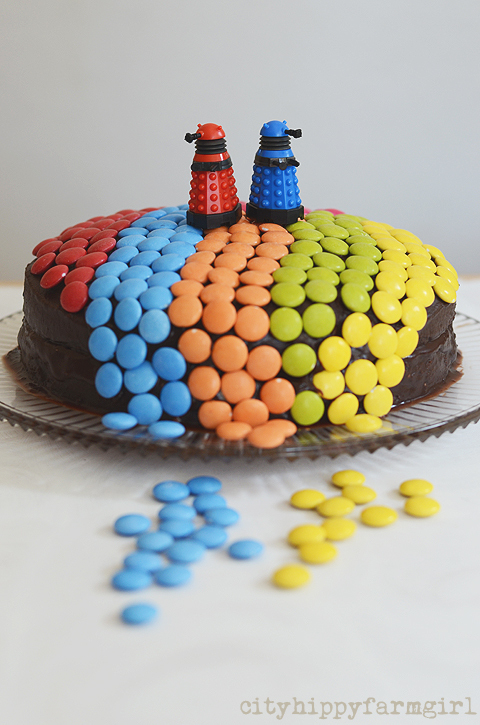 This entry was posted in Food Glorious Food and tagged bbc, birthday cake, cake, dalek, doctor who, dr who, dr who merchandise by cityhippyfarmgirl. Bookmark the permalink. Awesome cake Brydie! I feel like a traitor but I much prefer the face on your Luna Park to ours..
Looks delicious! Happy birthday to your eight year old!! Blue smarties were the most exciting ones when I was 8 years old. They never used to be included in UK packs so we’d excitedly get to eat the blue ones while on summer holidays in France. Simple pleasure when you were 8, they tasted just the same as the others! simple pleasures indeed Richard. If only life would go back to those tiny happy moments. I had jelly recently, ick. Definitely not the same as when I was a kid! Happy birthday to your little guy! What are his thoughts on the new Dr? I tell you some of MY thoughts Christine…I’m not so sure!!! I don’t blame him for being excited- beautiful cake- and Luna Park- a theme park I assume looks like fun! It is Heidi. Luna Park has been going for a long time in Sydney. I was so curious to find out what a dalek cake was. I was thinking a greek marble cake – silly me, I should of known since I have a little star wars lego enthusiasts. Happy B’day to your big boy and a really cool cake! What a wonderful cake! I love it!! Really love it! Happy Birthday Monkey!! Fantastic cake, just right for an eight year old! Happy Birthday young fella! And Who wouldn’t be excited with a cool cake like that! Happy Birthday to you son and Happy New Year to you all! What a cute cake to celebrate being eight years old. I always get a smile when I stop by to visit.